As Medical Device labels become increasingly complex, with multiple information to be printed to fulfill regulatory UDI requirements or internal corporate requirements, Medical Device manufacturers have started to consider the benefits of fully automated label inspection. Unsurprisingly, concerns over product labeling have become more and more of a popular topic for this industry. While there is obviously concern over counterfeiting and grey market sales, there is an additional concern at hand: proper usage of medical devices in the home. As technology becomes more compact and more effective, people are living longer and it has become more common for some medical devices which would have formerly only been used by medical professionals in a hospital to be available for home operation by someone who may only be partially trained – or may lack training at all. As a result, it is not surprising to see that medical device labeling is now full of standardized symbols and warnings to allow users to quickly know the basics of operation. This will only increase in complexity as manufacturers consider the merits of adding QR codes to medical devices which would allow users to quickly access the device manual online by scanning it with their smartphone. The same code could even link users to alerts about the device – a product recall, or an additional bit of critical information added after user feedback. It has the potential to be an immensely useful tool and, unfortunately, something of a headache for manufacturers. The more complex a label becomes, the greater the chances are that something might get misprinted. With such information being, occasionally, a literal matter of life and death, it makes the potential problems of a defective or poor-quality label much greater than they would be otherwise. Beyond a certain level of complexity, it becomes a waste of time to attempt to conduct manual inspections of device labeling of every device produced. It is simply too time-consuming a process, which is why automated vision inspection has become more of a common sight in the production world. Unlike label complexity, vision inspection is only getting easier to accomplish. As camera technology improves, high resolution cameras capable of producing clear images of complex labeling. Inspection software takes these images and verifies the presence and accuracy of all the information in question, including the readability of QR codes. Much like medical technology, vision inspection technology has reached a point where it is flexible enough to fit into most existing production lines at any point on the production process – they can inspect labels as they are printed, or they can inspect them after they have been applied to a device. The question of where to most effectively place an inspection solution can be answered by an experienced vision services provider. METTLER TOLEDO CI-Vision has a robust portfolio of vision inspection systems for numerous applications, including label and print inspection. In particular, our expertise with inkjet print inspection including dot matrix print can ensure critical label information is present and correct. 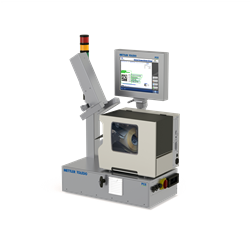 Our V26 series of systems provide accurate, high-speed inspection of product labels, while our V28 series of systems simultaneously print and inspect labels before application. Regardless of product size or shape, METTLER TOLEDO CI-Vision systems have the necessary flexibility to perform an effective inspection, with the option to automatically remove products with defective labels from the production line, or alert operators in the event of multiple consecutive failures.